It takes me a while to select a scene for my Thursdays Drawings, I actually had five to select from for next week but something in me said, wait there’s one more to look at. Well one thing led to another . . .
Before you know it, I’ve got my next project ready for next Thursday. It’s a little complex for charcoal so I spent a 1/2 hour sketching it out (on a scrap piece of photocopy paper!) 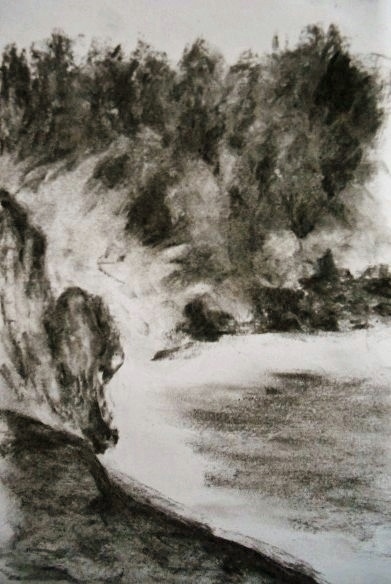 to see if the medium would do the scene justice with the water, splash and rolling waves coming into shore – I’m sold on the results and think charcoal will work perfectly. Next Thursday I’ll be beginning the actual charcoal drawing, which will change a bit from what you see here, but for today I thought I’d share the results with you. The sketch is called, Grand Slam – on 8.5 x 5.5 (charcoal). Funny how things work out don’t you think? I’m currently working on a portrait and may be able to complete this weekend. Hope your Friday is a good one – click onto image for a larger view. Well hi Miss Cat!! Wonderful to see you again – love how hard you are working these days, the rewards are shaping up very nicely. 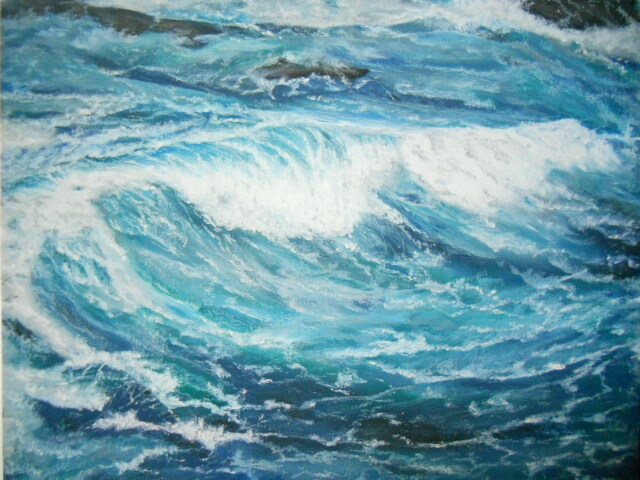 Thank you for taking the time to look at my recent art pieces and for your lovely feedback, you are very sweet. And, thank you w/re to the copyscape information, I’ll be checking it out later today. Have a great week ahead as you continue making beautiful music! Thanks Elizabeth! I’ve started phase I and not so sure I like the beginning, so I may be making a few changes to the scene – we’ll see, all depends on where the piece takes me while working on her. Thanks Elena, it will give me a lot to work with (maybe even more frisket!). Can’t wait for tomorrow when I get to start on it. Wow – so much detail already! It’s looking good. Thanks Fiona – have a beautiful week finding amazing scenes through your lens. Hi Rhonda, thanks so much – it’s feeling right to me, with a few minor changes it’s ready for a larger surface. Think I might use charcoal, carbon and graphite in this drawing. Thank you Jo, you are very kind – it didn’t impress my husband (lol). The real test will be whether I can translate this into a larger piece that reads well – I’m excited to lay it out the composition and go from there. Have a great week, my husband and I went on a 3.5 miles walk through a forested park by us yesterday and I thought of your Monday walks (only I forgot my camera). You are very kind A! – thank you very much. Stay tuned, I’m excited for this project and hope the results look as I envision – will take a few weeks to complete (for Thursdays drawing project). Stay warm! Up to a rousing 20 over here today so we’re good! Thanks, Mary. You may recall that I enjoy bits about the process … and in this case, I had no idea you would start with a sketch it get an idea if charcoal would work. Fascinating! Thanks Frank, but stay tuned there will be some frisket and fixative added to the process. Oh this is a good project to work on! I can see why you are satisfied that this is going to work. It already has the feel of wild motion. It can actuallly stand as is, but then I am not a professional art critic. I just know what I love. You got it Dorann! Yes, there will definitely be “wild” motion and if done properly you might even be able to imagine hearing the roar and slam. Thanks so much, have a great weekend – we have an ice storm coming in here tomorrow through Monday. “Grand Slam” it is, looking forward to see this, you got me all exited! It appears to be just as dramatic as your sky, I’m ready to take the journey on this one! Have a most wonderful weekend Mary! Thank you M.R. we’ll see what you think once it gets going! Have a great weekend – hey were you in the way of those nasty storms? Your Grand Slam looks great and it reminds me of a place by the beach I go to every summer! HI Marina – ah, now that must be a gorgeous place, I miss living by the sea. I hope I do this scene justice – will be 9×12 with some minor adjustments to the landmass, etc. Hope you have a happy weekend as well! Any announcements yet on your album? I really enjoyed my visit here today. Your artwork and style are very appealing. Thank you for visiting Resa and for your lovely comment! Have a great weekend. Thank you Jet – appreciate it! Have a great weekend finding interesting subjects to capture with your lens! Thanks so much Cindy. I’m excited to get started, but I’ll wait! I like where this one is headed, and I really like your copyright notice here.. surely no one would be brazen enough to right click.. but ha, we know better. Thank you my friend – over December break I found more of my images on the internet, shame right? It’s a sad circumstance and I hate the way the message looks. I’m exciting about this scene. Now that I know it can be developed, the real work starts on Thursday and between now and then I’ll have time to think about how to approach it. Thanks Z and have a wonderful weekend! How are the rains and storms? anyone who has had their images lifted will totally understand.. i remain amazed at how many people think if they find something on google images, that it’s free domain. The weather is weird right? Our daffodils and pink magnolia buds are ready to open, but we are going from 70’s yesterday to 30’s tonight and ice storm Sunday through Monday – wild ride. But rain, we just aren’t receiving it and will probably move into Stage 2 of conservation because our lakes have depleted by 21′ or more in some areas w/30 to 50% capacity for water supply. Scary, we need the rain. Surprised to hear how little you’ve received this year – I remember the last two years you were drenched and sloshing about in your boats. Take care ~ any more tour groups coming into town? Thanks Sylvia – have a wonderful weekend too!